The University of Plymouth will be continuing its research into the advancement of neuro-tumour treatments thanks to more than £100,000 from Great Ormond Street Hospital Children’s Charity and Sparks, the medical research charity. 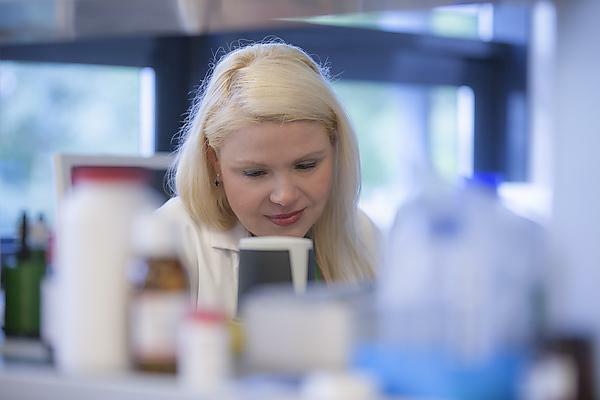 Led by Dr Sylwia Ammoun, Senior Research Fellow in Clinical Neurobiology, together with her co-applicant Professor Oliver Hanemann, the project team will use the funding to further investigate causes of hereditary condition Neurofibromatosis 2 (NF2). The grant follows the team’s 2017 study, published in leading cancer journal Oncogene, revealing the role of the normal, cellular form of prion protein (PrPC) in the development of NF2-related tumours. The team found for the first time that PrPC is over-produced in schwannoma (a benign tumour of the tissue that covers nerves) compared with healthy Schwann cells. This overproduction is due to deficiency of a tumour suppressor called Merlin, and strongly contributes to tumour growth and patient prognosis. Dr Ammoun is part of the University of Plymouth’s Brain Tumour Research Centre of Excellence – one of four institutions in the UK partnered with national charity Brain Tumour Research using ‘world-class’ research to accelerate progress towards finding a cure. The funding comes as part of a £2.1 million investment by Great Ormond Street Hospital Children’s Charity and Sparks, marking the largest charitable funding call dedicated to child health research in the UK. The £2.1 million is funding 13 more researchers at 10 different Institutions across the UK from Plymouth to Liverpool, looking at treatments for a range of diseases such as stem cell therapy for Duchenne Muscular Dystrophy, immunotherapy treatment for brain tumours, new treatments for children with a type of motor neuron disease, and diagnostic techniques for cerebral palsy. The projects reflect the ambition of the charities to enable new treatments to be taken from the lab bench to the patient’s bedside, speeding up the diagnosis and treatment of complex conditions. After completing her PhD dissertation at Uppsala, Sweden, Sylwia came to our Centre of Excellence for her post-doctoral research. "Research at the University of Plymouth is progressing and expanding. We have just finished phase 0 clinical trials on NF2 patients," she said. "We have a very effective, supportive, and strong team here and we are collaborating with other centres both in the UK and abroad." "A big thank you! Without you we would not get far with our research."